PLEASE NOTE: CBK Enrollment is closing April 5, 2019. The last day to complete an Online Orientation for the Spring 2019 semester is April 2. Students completing orientations done after April 2 will be called in July for the 2019/2020 school year. 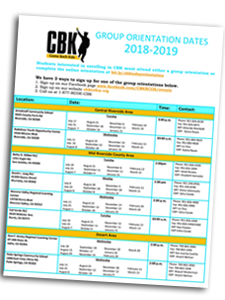 Step One: Sign-up and Attend a CBK Orientation either in person or online. For in person orientation visit the CBK Facebook Events Page for dates and locations and sign-up to attend. For online orientation complete an ONLINE orientation. Step Two: A CBK Attendance Registration Technician (ART) will be available at in person orientations to register students. Online registrants will be contacted to schedule a registration appointment. *”Proof of age shall be required of all enrolling students. The legal evidences of age, in order of desirability, are a birth certificate, baptismal certificate, passport, immigration certificate, Bible record or affidavit from the parent/guardian. Step Three: Meet with your teacher and get started on your future. For additional program details Call 877-RCOE-CBK. CLICK HERE to complete the online version of CBK Student Orientation.